Ask fellow campers about "R Shaefer Heard COE" and nearby attractions. Very nice campground on West Point Lake. We got site 93 (water and electric) on the 3rd loop. Long narrow back in that we did not have trouble getting into, but we are finally getting much better at backing. 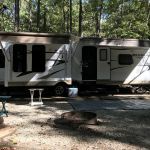 We spent one night on our way to the Fort Walton Beach, FL area. Next time, we would try to get site 91, which was a nice straight pull through with a deck and water view. Many of the campground's sites were on the water with easy site kayak access. We camped at R Shaefer Heard COE in a Fifth Wheel. Very nice COE campground! I wish the weather would have been nicer - cold and raining. Site was on the water and it would have been nice to sit beside the lake and enjoy the views. Site was large and neighbors were within sight but not earshot. I only stayed one night but I would go back for a longer stay. We camped at R Shaefer Heard COE in a Travel Trailer. Great COE park. We had a site on the water. We asked for a pull-thru and were given a double site that worked fine. Very quiet. Few boats in the water. We camped at R Shaefer Heard COE in a Motorhome. This park was absolutely beautiful. Stopped for an overnight visit and would have loved to stay longer. Big sites with plenty of room. We were in a back-in slot and there was plenty of room to stay hooked up. The sunset over the lake was breathtaking! We will definitely stay here again when we are in the area. We camped at R Shaefer Heard COE in a Fifth Wheel. Excellent campground, we chose a lake site and we were able to walk right into the lake ands swim. We camped at R Shaefer Heard COE in a Travel Trailer. The campground gets totally full on weekends. Beautiful wildlife, lake is clean. This is a huge COE campground. There are several camping loops and they have a different look depending on whether they are in the woods or on the water. There are no full hook-up sites but I think every site has electricity and water. The lake is beautiful and the mornings are full of birdsong. My only complaint was that we had accidentally chosen a site in the midst of a large family get-together and there were a dozen young kids running around having a great noisy time. We would have been happier in one of the more isolated sites. This CG is great for walks, jogging, dog-walking, and water activities like fishing and kayaking. It is very clean and well-maintained. We camped at R Shaefer Heard COE in a Motorhome. 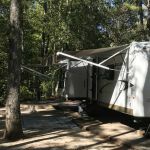 This is one of the cleanest campsites we have ever been in! Most sites are waterfront and many accommodate more than one vehicle. Some sites are clustered - great for families and groups. West Point Lake is clean - the water and air smell fresh and lovely unlike some lakes that smell of algae. Walking/biking trails aren't located inside the campground but there are plenty of them in the park. Army Corps of Engineers hit this one out of the ballpark. Can't wait to come back. We camped at R Shaefer Heard COE in a Motorhome. Bring your fishing poles and water craft. This is a huge lake that is clean and sparkling. It is in the south so red dirt colors the water. Gorgeous hiking trails. We stayed here twice, one night each time a week apart. The site was level; the utilities were within easy reach; the view was fabulous. We camped at R Shaefer Heard COE in a Travel Trailer. This is a nice COE Park with lots of woods, peace and quiet along the shore of West Point Lake. 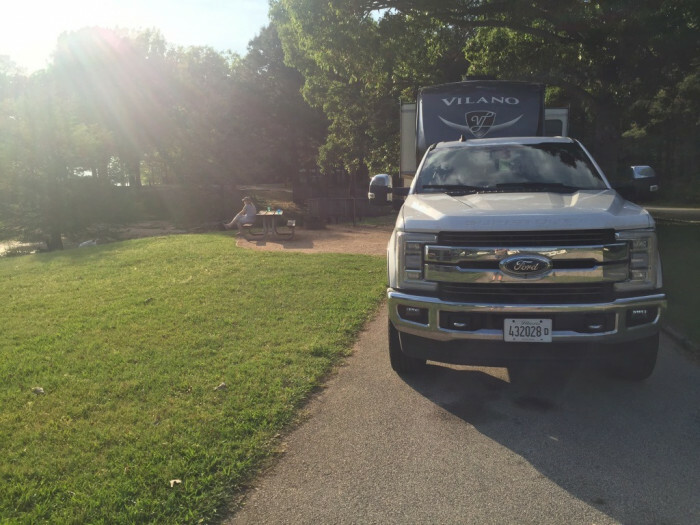 Most sites are large with plenty room for vehicle and boat parking. There only a few pull through sites and some of the back in sites looks to be a bit challenging to get in. Restrooms are few and far between and there is only a couple bath houses. The interior roads are paved as are the sites. Getting a satellite signal is a challenge if not impossible on most sites, but I had 2/4 bars Verizon service. Really a nice place. We will go back. We camped at R Shaefer Heard COE in a Travel Trailer. This park is one of the nicest COE parks we've visited. Clean. Sites are very private, for the most part. Most have nice lake views. Many are shaded. Double sided dump station. We were on #98 which had no shade but was very close to the water with a 180 degree view. Since it wasn't a hot day, it didn't matter about the shade. The sunset across the lake was beautiful. We intend to stay here whenever we are in the area or passing through. We camped at R Shaefer Heard COE in a Motorhome. Wonderful! Easy access off I-85. Easy turns for big rigs. Very clean and large sites. Wonderful views of lake. Most back-in but some pull - through. Most sites look level. Look for picture of site when making online reservations. Sprint cell service was poor and could only get a couple OTA TV stations. We camped at R Shaefer Heard COE in a Motorhome. Very nice. Hidden gem. Went in January. Only two campers in park. Quiet. Scenic. Used as one night stopover. Would like to have stayed longer. Would come again. Sites at waters edge. Tho it is dirt,mud to Waters edge depending on elev of the water, it was low at this time. We camped at R Shaefer Heard COE in a Fifth Wheel. Our campsite was nice and level, when the lake is full this will be a lake site. Verizon hot spot worked well as did our phones, we were able to pick up around 8 channels for the TV with our antenna. Bathrooms were clean, very small and no showers. The Fall colors were beautiful, we enjoyed riding our bikes thru the campground. It is a good weekend stay. We camped at R Shaefer Heard COE in a Motorhome. Everything is a good distance from the campground, next time we will tow our jeep. This vast COE campground/park system lies along the southeast side of West Point Lake in a mixed deciduous forest. The lake's dam is in the park. Located about 5 to 6 miles off of I-85 from the Lanett, Alabama or West Point, Georgia exits. Follow US 29 north out of West Point towards LaGrange. The campground is simply first class. Although there are road signs on US 29 marking the turn into the park, the large entrance sign is on granite and is difficult to read, especially at night. Inside the campground, directions to numbered campsites are well marked. 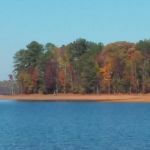 About 80% of the campsites are waterfront with panoramic views of the lake or its coves, mix of shade and sun. Most have a downhill asphalt driveway that slopes onto a level concrete pad. If a site had a level driveway, it was entirely fine gravel. We saw some evidence of bumper and hitch gouging on the concrete pad at some sites. Especially acute was Site #34. There are some pull-through sites, and many double sites. Some sites had wooden decks. 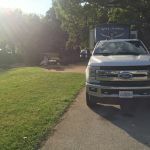 There are additional parking slips for extra vehicles or boat trailers, and on-road marked parking. Picnic tables with fine gravel sitting/campfire living areas are spacious. The distances between campsites vary from fairly close to downright isolation. Some sites have 50 amp service, majority seemed to have 30 amp only. Electric and water worked fine. Quiet and dark at night. Train horns can be heard in the far distance night and day. Dual direction dump station near gatehouse, no sewer at sites. Restrooms were quite clean, small, and had no showers in our loop. Fantastic roadways for walking, jogging, and bicycling. Dog poo was an issue on roadsides. In addition to the paved roads, there are 7 miles of off-road bicycling trails. There was a playground with a swing set and slide, and one tennis court. OTA DTV was limited to PBS and Cozi. Sprint phone was 3 bar and LTE. A few raccoons at night. We'd stay here again. We camped at R Shaefer Heard COE in a Travel Trailer. Downtown West Point has been restored. Drove to Callaway Gardens for Christmas lights. We're not impressed. Crowded. Pricey. To each their own, I suppose. WE only stayed for one night this time, but hope to return. As usual this COE campground is top notch. Didn't seem like any stores nearby, probably 4-5 mi. to nearest grocery. But load up on eats, 'cause you will not want to leave. Drive across the dam if you've never done that before. It took 35" to get to Callaway Gardens and about 45" to get to the Little White House. Are you affiliated with R Shaefer Heard COE ?